Scheduling packets to be forwarded over a link is an important subtask of the routing process both in parallel computing and in communication networks. 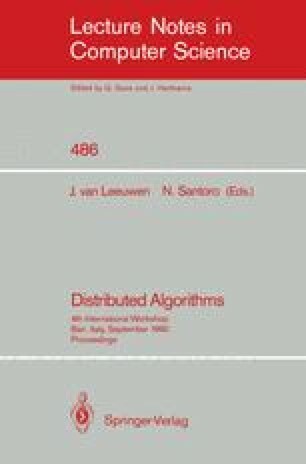 This paper investigates the simple class of greedy scheduling algorithms, namely, algorithms that always forward a packet if they can. It is first proved that for various “natural” classes of routes, the time required to complete the transmission of a set of packets is bounded by the sum of the number of packets and the maximal route length, for any greedy algorithm (including the arbitrary scheduling policy). Next, tight time bounds of Θ(n) are proved for a specific greedy algorithm on the class of shortest paths in n-vertex networks. Finally it is shown that when the routes are arbitrary, the time achieved by various “natural” greedy algorithms can be as bad as Ω(n1.5), when O(n) packets have to be forwarded on an n-vertex network. Supported in part by an Allon Fellowship, by a Walter and Elise Haas Career Development Award and by a Bantrell Fellowship. Part of the work was done while visiting IBM T.J. Watson Research Center.